PCC is required for many cases if you are travelling outside the country or to get the VISA or another country as well. It will take around 20-30 days. Cost - 500 Rs. 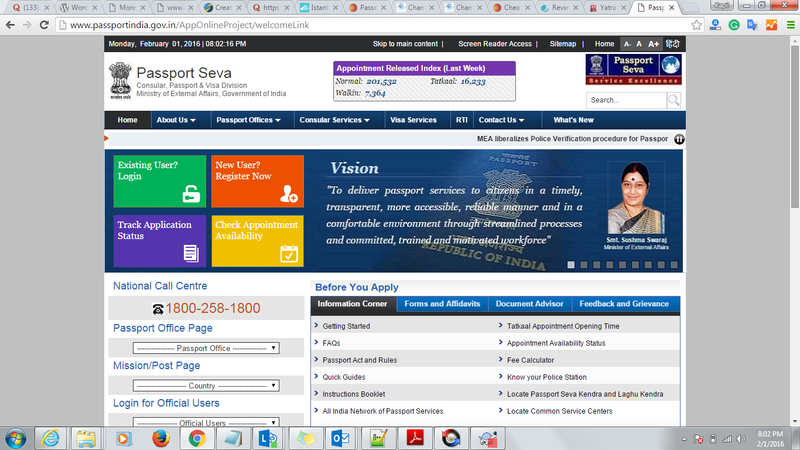 It will cost you 500 rs if you process it directly with passport office. If you with the agent then it will cost you 1000 to 1500 rs depending on the commission of the agent. I would suggest trying individually as it is much difficult now to apply and get the PCC. You can also get PCC from the police station but it will be in the local language and which will not work at many places. You can apply online to get the PCC. The site mentioned below will provide you the required information. Once you login to Home Page- You can see the Button - "New User? Register now" on the right top of the screen. 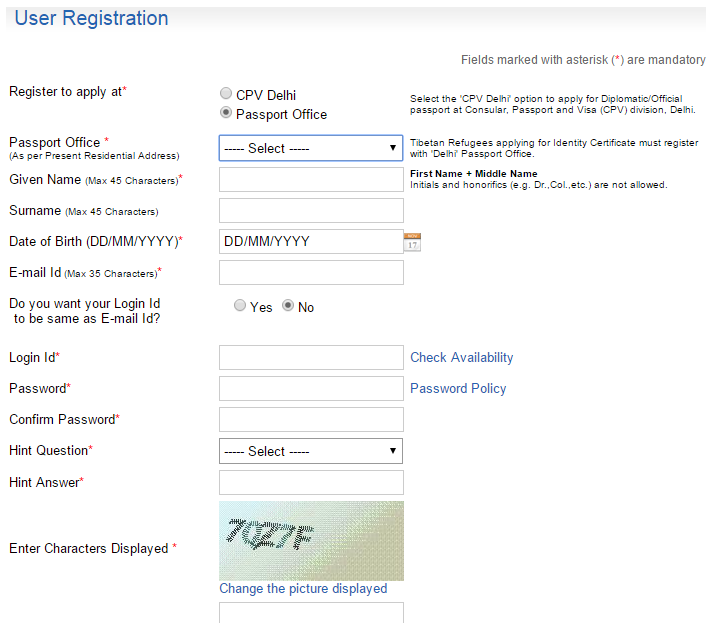 To create an account click on it & fill the details mentioned in the form. To Register, create the username & password for your account. Provide the details like DOB, email id and hint questions. Each account is linked with unique email id. Once you submit the form you will get the confirmation link to your mentioned email account. Verify the account before 24 hours of time. After 24 hours you will not be able to verify your account. Now you can try to login with your register username and password details. You will get the below options after login. 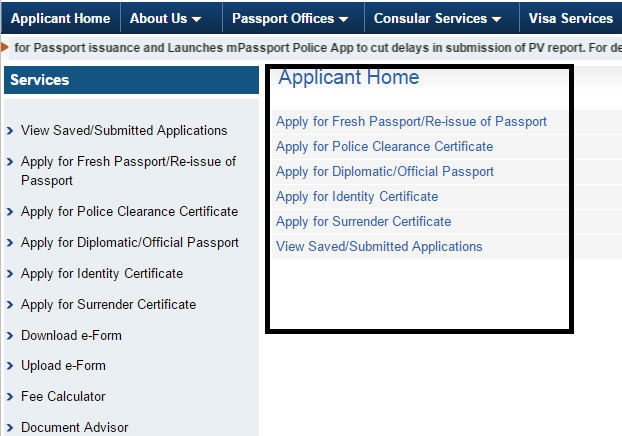 Select "Apply for Police Clearance Certificate"
There are two options available to submit your application. You need to fill the details like, Name, Address, Reference, DOB for yourself and your family. 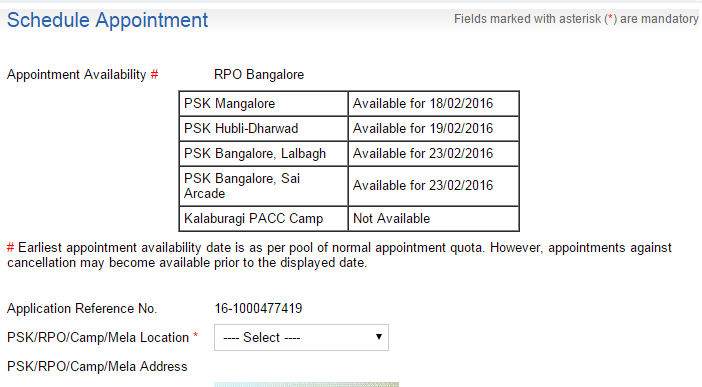 They will charge you 500 Rs for PCC certificate application charge. You can pay by Credit card, Debit card and Net banking of any nationalized bank. Other than SBI card they will charge you 2% to 8% depending on the type of card. There are many documents which you can submit as address proof. · Letter from Company in which you are working. 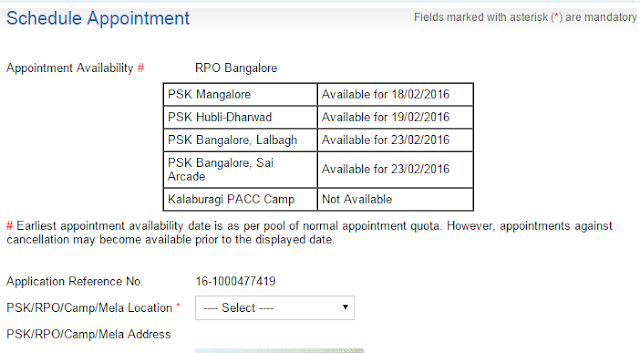 In Bangalore, there are two location you can select for the appointment. The Sai Arcade in Bellandur near Marathalli is the best and provide the fastest service among all. Service is very good and handled in the profession in most cases. Before going be ready with all the list of documents suggested above. They may or may not ask for original documents to display. But you need to carry the Original passport with you. You need to carry mail copy you receive as an invitation for the appointment &h application form printout. It is necessary as all verification is based on that only. You need to be there before 15 minutes prior to scheduled time. You need to park behind the passport office (Sai Arcade) and parking is chargeable. Parking fees is 20 rs. If you forgot to carry xerox then xerox shop is available just near to passport office. You can take the print from internal as well. If you are ready with all set of document then join the queue suggested by them. Once your turn will come they will verify the documents, passport and details written in the application form. If there is mismatch then you need to feel the correction form. You also need PCC request form. So there will be three form. You need to fill the general information like name, location address, and AR number. AR number is given in application form. Ofter basic verification they will give you the token number, which is the reference for the further communication. Now you need to go the officer who will take your documents. Officer will check & verify the documents, cross checking of details given in the form with supporting document & passport. If everything is fine then he will scan the documents and store it as record. He will take your photo which will be displayed on the form which is reference for further communication. Here one more round of verification will happen for the same supporting documents. 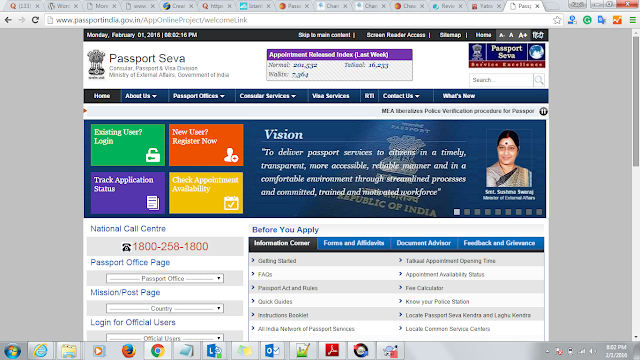 This is the final stage of verification, where your record will be checked against your passport. They will check the details like how many times you have applied for the passport, is there any reject, connected criminal records. If everything is fine then they will issue the police clearance certificate to you. This complete process will take around 3-5 hours depending on your luck and number of applicant. At exist station, you need to fill the feedback form for the service provided by them. Inside the office you can avail the food also. But there is very limited items available like puff, juice, tea etc.,Before going be ready with all the list of documents suggested above. They may or may not ask for original documents to display. But you need to carry the Original passport with you. You need to carry mail copy you receive as an invitation for the appointment &h application form printout. It is necessary as all verification is based on that only. You need to be there before 15 minutes prior to scheduled time. You need to park behind the passport office (Sai Arcade) and parking is chargeable. Parking fees is 20 rs. If you forgot to carry xerox then xerox shop is available just near to passport office. You can take the print from internal as well. If you are ready with all set of document then join the queue suggested by them. Once your turn will come they will verify the documents, passport and details written in the application form. If there is mismatch then you need to feel the correction form. You also need PCC request form. So there will be three form. You need to fill the general information like name, location address, and AR number. AR number is given in application form. Keep India Clean - "Swachh Bharat Abhiyan"